So what do we need to create worlds with raymarching? 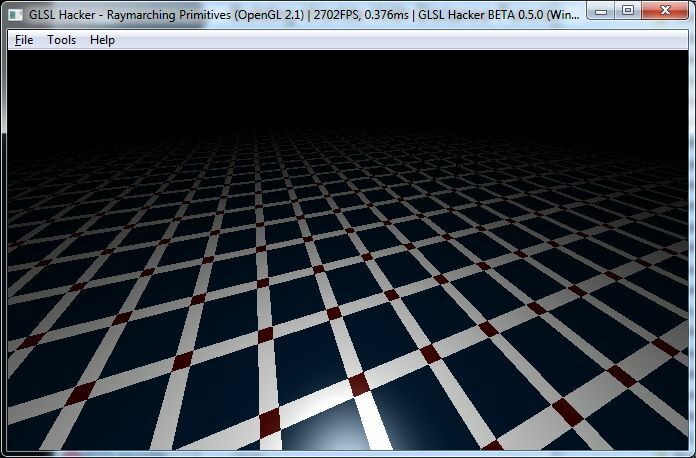 It’s really simple: a quad (two triangles) and a GLSL program made up of one vertex shader and one pixel shader. This GLSL program is used during the rendering of the quad. That’s all! // y is used to manage materials. This GLSL framework takes its source from this demo and this demo by Paulo Falcao. Hey. Just found this. Came across iq’s stuff a while ago, but being a noob I couldn’t do anything with it. Then while rediscovering GLSL & iq’s website, I found this awesome resource! I’m fixing the errors and I upload the code samples asap!